සාධාරණ සමාජයක් සඳහා වූ ජනතා ව්‍යාපාරයේ කැඳවුම්කරු කෝට්ටේ ශ්‍රී නාගවිහාරාධිපති පූජ්‍ය මාදුළුවාවේ සෝභිත හිමියයෝ අපවත් වූ බව මහත් සංවේගයෙන් දැනුම් දෙමු. අපවත් වන විට 74 වන වියේ පසුවූ උන් වහන්සේ මෙරටදී සිදු කරන ලද හෘද සැත්කමක් ඇතුළු සැත්කම් දෙකකින් පසු අසධ්‍ය වී විශේෂ ගුවන් යානයකින් විශේෂඥ වෛද්‍යවරයෙකුද සමඟ සිංගප්පූරුවේ මවුන්ට් එලිසබෙත් රෝහලට යොමු කලේ රජයේ අනුග‍්‍රහයෙනි. එහිමියන්ගේ ජීවිතය බේරා ගැනීම සඳහා විශේෂඥ වෛද්‍යවරුන් හත් දෙනෙක් ඇතුළු විශාල කාර්ය මණ්ඩලයක් මහත් වෙර දරුවද මේ සටහන ලියැවෙන්නට තිබුනේ මෙහෙමය. 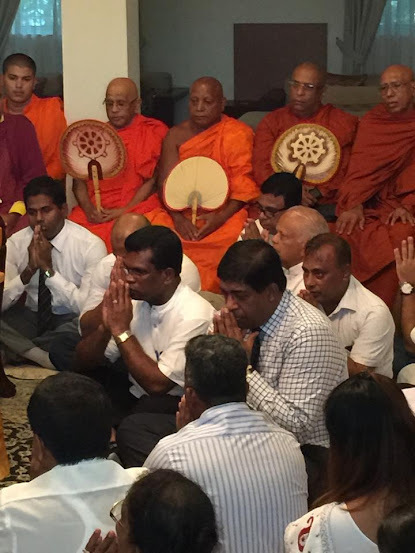 රාජපක්‍ෂ රෙජිමය පෙරලා දමා වත්මන් යහපාලනය ගෙන එන්නට පෙර ගමන්කරුවා වූ උන් වහන්සේට යහපාලනයේ නියම ඵල සියැසින් දකින්නට ඉඩහසර නොලද්දහ. අනේ කොහොමට ජනතාව ගරුකළ හාමුදුරු කෙනෙක්ද ?අන්තිමේ නීච දේශපාලකයකුගේ අත් අඩංගුවට පත්වෙලා ජනතාවගෙන් බැනුම් අසමින් මැරෙන්න සිද්දවුනා . ඔවුන් මියගියත් ඔවුන් මුර දේවතාවුන් වගේ මේ රට රකිනවා. රට කොටින්ට පාවාදුන්න එවුන්වයි උන්ගේ දරුවන්වයි ඔවුන් සොයාගෙන ඒයි. නැත්නම් ඒ සිංහල ලේ වලට වටිනාකමක් නැතිවෙනවා. මුං වපුරා තල නෙලිය නොහැක යන බුද්ද දේශනාව අවසානයේ ඔබ වහන්සේට මනාව යතාර්ථයක් වී දර්ශනය විය. ඔබගේ දැඩි සිත් තැව්ලට හේතු වූයේද ජඩ පාලන වපුරා යහ පාලනය බලාපොරොත්තු වූ නිසාය.. එය ඔබ වහන්සෙට තේරුම් ගියේ අස් වනු නෙලීමට ගිය විටය..
ජාතික ආරක්ෂාව අනතුරේ හෙලා, දෙමල බෙදුම්වාදයට රට පාවාදීමේ ආනන්තරීය පපකර්මයට” ඔබවහන්සේ දැනුවත්ව හෝ නොදැනුවත්ව දායකවී ඇත. ඔබ වහන්සේ දැන් නෙලාගත් ජඩපාලන අස්වනු බුක්ති විදීමට අප අතර නැත, නමුත් අප හා රටේ අනාගතය ජඩ පාලන අස්වැන්න බුක්ති විදිය යුතු වේ. බුදු දහමට අනුව පව් සමාකල නොහැක” එසේම පව්” සහ පින්” එකිනෙකින් අහෝසිවීමක්ද සිදුනොවේ. ඔබවහන්සේ කරන ලද පින් සහ පව් වල කර්මඵල වෙන වෙනම බුක්තිවිඳීමට සිදුවනු ඇත. මාදුලුවාවේ සෝභිත හිමියනි ඔබට නිවන් සුව…!!! අප කොපමණ නිවන්සුව පැතුවත්,සෝභිත එකතු කලේ පවුකාරකම් පමණි, එකතු කලේ කල්ප ගණනක් අපාගත සුවයට අවශ්‍ය පිං පමණි, සොබිතට අවශ්‍ය වුවේද එපමණකි, එසේ නම් සොබිත පැතු එම අපාගත සුවය එසේම ලැබේවා. රතනං පනිතා ටත් අපේ භාන්දාගරෙන් සිංගප්පුරු වියදං දරනවාද නැද්ද යන්න දැනගැනීම අපේ මුලික මිනිස් අයිතියකි. රතනෙගේ පෙට්ටියට නම් කියක් හරි දුන්නට කමක් නෑ. මට දුක ඕකා මැරෙන්න ඉස්සරවෙලා කොහෙදි හරි ඕකාට කුණුහරුපෙන් බනින්න බැරිවෙච්චි එක ගැන . හොර උපාධි කඩයක් නිසා රටක් වටින හිමි නමක් දැයට නැති උනා. පූජ්‍ය මාදුළුවාවේ සෝභිත හිමියනි ඔබ වහන්සේට නිවන් සුව පතමි!!! ඈත අතීතයේ සිට… මව්බිම සුරකිනු පිණිස…. විරුවන් ඉහලට එසවූ අසිපත් සිඹගෙන…ඈත අතීතයේ සිට එන සුලඟ…. තවමත් මව්බිම සුරකින බවට සාක්ශි තමයි මේ! මව්බිම සුරකින සැබෑ දේශප්‍රේමීන්ට ජයවේවා! මව්බිමට ජයවේවා! මව්බිම සුරකින රණවිරුවන් සැමදා සුරැකේවා! umba wage bath bela wahallunta noterunata apita me hamuduruwo godak watinawa…mokada mahinda rata nati karagena yanakota me hamuduruwo tamai beragatte. දැන්වත් තෙරෙනවද මාලබේ වෛද්‍ය උපාධියේ බලය. රටට ගව පාලනය ගෙනල්ලා රට කොටියට ලියලා දුන්න පවට තමයි නෙවිල් ප්‍රනාන්දු කඩෙන් බෙහෙත් ගන්ඩ හිතුනේ. ඇත්ත, මටත් මේ හමුදුරුවොන්ට බනින්න නම් හිතෙන්නෙම නැහැ. උන්වහන්සෙ ලංකාව ගැන අවංකවම දුක්වුණා, මහන්සිවෙලා වැඩකරා. ආණ්ඩුව වැරදි කරනවා දැකල හිතේ අමාරුවෙන්ම ලෙඩෙත් වැඩිවුණා. අනිත් නායකයොත් මෙහෙම අවංක නම් අපි කොච්චර වාසනාවන්තද? වරද උන්වහන්සේගේ නෙවෙයි උන්වහන්සේව ප්‍රෝඩාවකට හවුල් කරගත්ත දේශපාලකයො අතෙයි..
පැරදුන වුන් හොරපාරෙන් පාර්ලිමේන්තුවට ගත්ත එකටයි ඇමතිකම් දුන් එකටයි උන්වහන්සේ විරුද්ධව කතා කරා. ඒවා කනකට නොගෙන කිසිම ලැජ්ජාවක් නැතුව තවදුරටත් ප්‍රෝඩාව ගෙනියන අතිගරු තුමා තවමත් යහතින් වැජඹෙනවා. නැති ප්‍රශ්නයක් මවා පෙන්වමින් රට ප්‍රශ්න ගොඩකට තල්ලු කල උන් වහන්සේට සොබා දහමින්ම දඬුවම් ලැබුණ බව කියන්නට උඹලා මෙච්චර බය ඇයි…..? ෂෝබිත , වටරැක , රතන , දඹර අමිල , තිබ්බොටුවාවේ , අත්තදස්සි සැමදා උදේ සවස ජනතාවගෙන් ආශීර්වාද ලබයි . එසේම බාහු , අනුර කුමාර , චන්ද්‍රිකාද ආදිහුද ආශීර්වාද ලබමින්ම් සිටිති . රොටිය කරවුනා නේද හාමුදුරුවනේ? සෝභිත හිමි අවසාන මොහොතේ මහින්දට කී දේ! මාදුළුවාවේ සෝභිත හිමියෝ කොළඹ පෞද්ගලික රෝහලේ ප්‍රතිකාර ලබමින් සිටියදි උන්වහන්සේ බැහැදැකීමට හිටපු ජනාධිපති මහින්ද රාජපක්ෂ මහතා එහි ගිය විට උන්වහන්සේ කිවේ එක දෙයකි…..”අපිට වැරදුනා මහත්තයෝ ” යනුවෙනි.නමුත් මහින්ද රාජපක්ෂ මහතා සිනාසුනා හැරෙන්නට කිසිවක් කිවේ නැත. මව්බිම සුරකින විරුවන් අත රැඳි අසිපත් සිප අතීතයේ සිට ආ සුලඟ….. මහින්ද සුලඟ සමඟ එක්වී…අදටත් සැබෑ දේශප්‍රේමීන් රැක ගනිද්දී සෝභිත හිමියෝ තමන්ට වැරදුණු බව තේරුම් ගෙන මව්බිම හැර දමා ගොස් ඇත. මේ බුදුන් වැඩි දේශයට…බුදුදහම මුලු ලොවටම දායාද කිරීමට සුරැකුණු මේ පින්බිමට ….අතවර කිරීමට කිසිවෙකුටත් ඉඩ නොලැබේ! කළ ගුණ දත් බුද්ධිමත් සත් පුරුෂ ජනතාව සැමදා දෙවියන් සුරකියි! ඕක කියන්න කල් වැඩි. තව ටික කලක් ඉඳලම කිව්වනම්. ඕක save කරලා තියාගන්න. අනේ ගොනෝ, මාස 10ක් තිස්සේ තටමනවා එක හොර කමක් ඇල්ලුවද? හොයන්න හොයන්න ඔප්පු වෙන එකම දේ; කිසිම හොර කමක් කර නැති බව පමණයි. තොපි කොච්චර තප්පුලෑවත් ඔච්චර තමයි. තණකොල ටිකක් කාලා පාඩුවේ හිටින්. විනාසයට මෝඩකම නිසා මුල්විය . විනාසයට කුහකකම නිසා මුල්වුවෝ තව ඇත. විනාසයට වෛරය නිසා, පර ගැති කම නිසා, ඩොලර් පෙරේතකම නිසා මුල්වුවෝ තව කොතෙක් ඇද්ද. ඔවුන්ගේ ඉරණම ???????? උන් වහන්සේට යහපාලනයේ නියම ඵල සියැසින් දකින්නට ඉඩහසර නොලද්දහ. Is he the first victim of the Yahapalanaya that divides Sri Lanka and sacrifices the war heros to receive applause from USA and the West ? RIP and may he attain everlasting peace. Another victim of the Catholic Church. He joins millions of other victims of the Catholic Church. He was roped into betray his religion and race by the late Catholic Jayalath Jayawardana and I guess Ravi Karunanayagam. To a certain extent I believe that he was blackmailed to do what he did in the end – handing over Sri Lanka to a Catholic Administration. By the time he realised his treachery and how he was fooled the foul deed has been done. Once in power the Yahapalana Traitors simply neglected hims as if he did not exist. 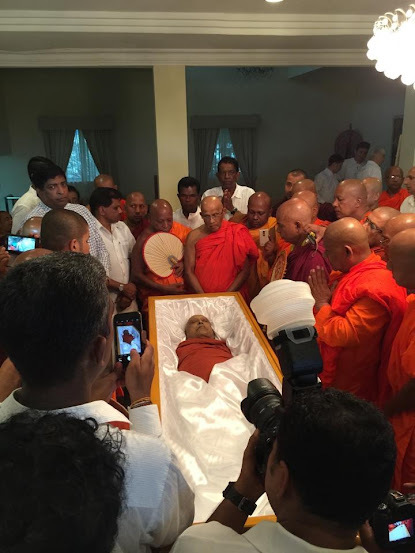 He was a great voice for Buddhism and Sinhala rights in the past. If one looks at his past – it is easy to discern that he was always confused as to his proper vocation. His ego took him to realms unknown and he got mired in a quagmire of lies and deceptions. That is the best tribute we can give to those who give their lives due to intense caring. Hiranthe, If Gota lost the war he started in Mavil Aru, to release the water control valve. Sobitha Thero would have been the Govnor of Eastern Province reporting to Parbhakeran. Now make your own assessment. He said if he stops the military advance on Mavil Aru he will chase KARUNA out and build him a mansion. Then every thing went sour he wanted to contest a Parliament seat from SLFP. MR said no. Then Ranil Punk wanted to use him and was promised him to contest a seat from UNP. After RANIL punk let him down. He became MR supporter which he did not want and did not reply to his meeting request. Now comes the name change to Naga Deepaya. Then he got all worked up, but now he was a man with a heart problem and needed funds to travel to Singapore and MR did fund it from Tax Payers money. Apart from Privana education he was an illiterate. Just because a man shaves his head and puts a yellow robe one cannot judge that person as an honest person. Example: The monks that went with Srisena President to Thai Land do you think they are pious monks? Far from it. Srisena President paid them handsomely. 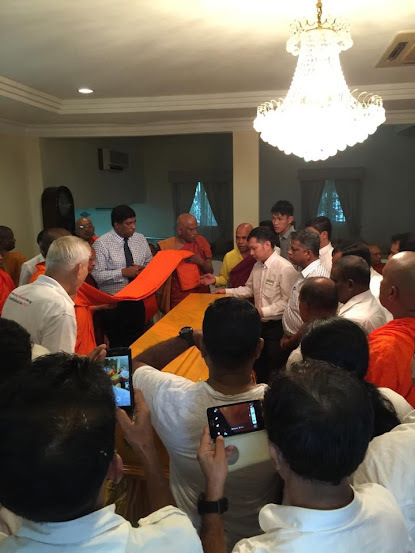 What Sirisena was told to do by Muslim Obama, was to find out if the Buddhist monks can be instigated to go against the military regime. If you don’t Hiranthe challenge me. Charles, touched on a area where he did not go deeply enough and I like to add a probability factor to it. I got the following form “Ceylon Today” web page; Owned and funded by CIA / FBI. These may be coincidences but I say NO. Yester Day the head of the INDIAN AIR FORCE Spoke to the Graduating students that China is surrounding INDIA by giving low loans to her neighbors, Sri Lanka, Bangladesh, Afghanistan, Nepal and Pakistan; low interest loans. China even gave Supreme Court complex and Stated that it is a gift from Peoples of China to Sri Lankan people and the relation ship goes back 5000 years. My question is why did this head of the Indian Air Force wait till MR was defeated give such a statement about Sri Lanka? Dis-Information about Sri Lanka is complicated and must be understood on a weekly basis. Why would CIA / FBI want to get rid of Sabetha Thero Now? MUSLIM OBAMA’s thought process is that the Student uprising will connect with Sabetha Thero’s ” GOOD GOVERNESS” movement. 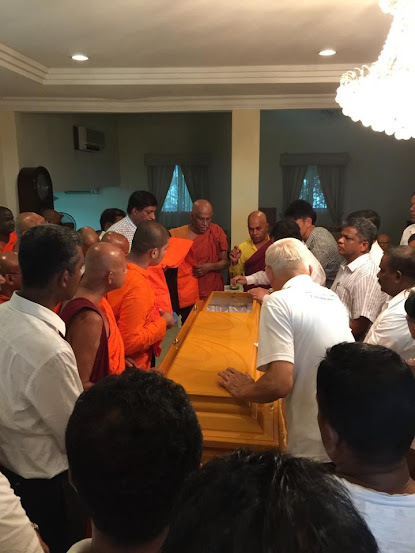 This already have a leader, namely Sobitha Thero. If they get rid of him then it is then a leaderless organization and can be controlled easily.